Two years ago Upper Deck came out to Dave & Adam’s Cardworld in Williamsville and fans are still talking about it. Quite frankly it was a night to remember for everyone in attendance! We had such a good time that we decided to come back this Thursday, May 17, 2018 from 6:00-8:00 p.m. for another unforgettable Upper Deck Night! 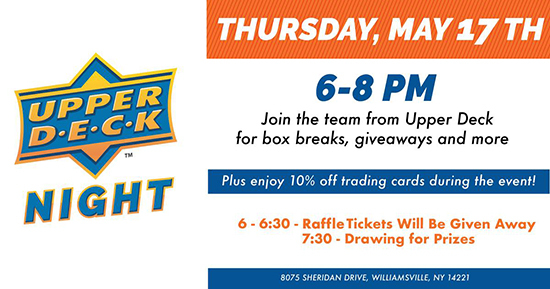 Upper Deck will have a variety of giveaways for fans of all ages that night and you can score 10% off trading card purchases during the event. Upper Deck’s Chris Carlin will be in attendance to talk product with fans and answer questions collectors may have. Some of the prizing will be quite cool and one of the top prizes will be a 2017 NHL Draft™ blow-up ticket signed by every first round pick including Casey Mittelstadt of the Buffalo Sabres! 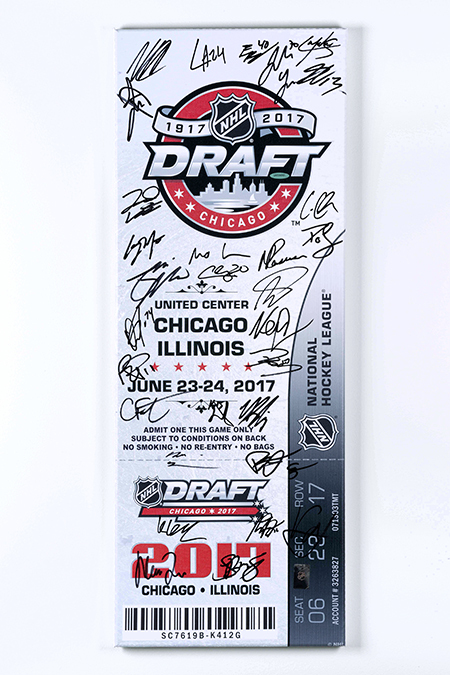 Every first round pick from the 2017 NHL Draft signed this blow-up ticket! Don’t miss out on what is sure to be an incredible evening with Upper Deck! And this weekend, don’t miss Nickel City Con in Buffalo! Upper Deck will be on-site and sharing FREE entertainment promotional packs while supplies last. See you in Buffalo!